Overview - With over 6 billion people to feed, how do we change our current practices to have a kinder impact on the Earth's fragile ecosystem? This stunning visual tour of our world takes a closer look at the impact industrialized farming and wildlife conservation are having on individual people, communities and our environment. It presents real people finding tangible solutions to restoring our planet. Hosted by world famous photographer Yann Arthus-Bertrand and inspired from his best-selling book, Earth From Above, it is a call-to-action for greater awareness, renewed intention, and management of our depleting resources - a global call for sustainable development. Yann Arthus-Bertrand Photographer, Filmmaker, Activist, Environmentalist -- Born in 1946, Yann Arthus-Bertrand has been interested in the wilderness and animal world throughout his lifetime. Using a camera, he started to create a record of his observations and eventually discover his gift: testifying through images. In 1991 Arthus-Bertrand became a photojournalist and founded Altitude, the leading aerial photography agency in the world. Inspired by the link between humankind, wildlife and nature, he partnered with the United Nations Educational, Scientific and Cultural Organization (UNESCO) to focus his vocation on a long-term documentary photography series: The Earth From Above, Wild Animals, Horses, and 365 Days. In 2007, Arthus-Bertrand helped Al Gore present his Academy Award-winning film, An Inconvenient Truth, to the French Parliament. Hosted by world-renowned French photographer, filmmaker, activist, and environmentalist Yann Arthus-Bertrand (wait, who? ), 'Earth From Above: Food and Wildlife Conservation' takes viewers on an aerial tour of the globe, while frequently touching down to the ground to tackle various topics dealing with farming and the animal kingdom. Separated into a pair of two-part programs, the show investigates the perils of industrial farming, pesticides, animal poaching, and a variety of other environmentally devastating practices that are sure to brighten up your day. Throughout the four episodes, Arthus-Bertrand (who's dubbed over by an English narrator) guides us along, smiling his way through a bevy of locations in France and other parts of the world. While the four episodes offer some decent information and visuals, the program is ultimately lacking, and suffers from an occasionally superficial scope, preachy tone, biased agenda, and disorganized structure. The first two-part segment is titled '6 Billion People to Feed,' and primarily addresses concerns about food production and problems facing the global farming industry. Overhead shots of numerous French landscapes are covered, providing some decent visuals. The brunt of the material is made up of the host interviewing several experts and farmers -- and by "interviewing," I mean smiling and nodding politely while they speak. Seriously, as presented here, Arthus-Bertrand really does nothing more than stare at his guests with a big, silly grin on his face (which is all the more unnerving considering the often depressing topics they cover). While he might not be the most hard-hitting interviewer, the experts do provide plenty of information, mostly detailing threats to our ecosystem and the pitfalls of our detrimental farming practices. The dangers of industrial farming and pesticides are also addressed (with a heavy emphasis on the latter's unfortunate effects on human beings) and some talk is dedicated to potential issues with GMO (genetically modified) crops. One of the most telling segments involves footage of a poultry farm, and while not particularly graphic, the resulting images are quite disturbing. Almost from the second they're hatched, the chicks are carelessly loaded into machines to be sorted, and then in just eight weeks they're already herded off to the slaughterhouse. I'm not claiming to be a vegetarian, but the whole process is anything but humane. The second two-part episode is called 'Do Wild Animals Still Exist?' The focus now shifts to endangered animals and mankind's negatives effects on their natural habitats. Once again, various aerial views of the locations spotlighted are offered (primarily in South Africa). Interview segments with conservationists are provided, and this time Arthus-Bertand is actually a bit more engaging with his subjects (though he still has that silly smile on his face). Efforts to save Elephants, seals, bees, tigers, and bears (oh my!) are all highlighted, with guests providing insights into the dangers these animals face and how man is working to undo the damage they've already caused. There's even a segment focused on Jane Goodall and her groundbreaking work with chimpanzees. Some brief but gruesome clips revealing the horrible realities of tiger poaching, seal clubbing, and dolphin slaughtering are also featured for your viewing plea -- err, discomfort. My favorite segment involves some rather pesky penguins that populate the Cape of Good Hope in South Africa. The curious birds actually mingle with people right on the beach, and are known to wreak havoc throughout the town at night, often keeping locals up with their silly penguin shenanigans. Another interesting but slightly ponderous piece involves a ghost town near Chernobyl. Abandoned due to the nuclear disaster, the small village is now populated by wild animals. While the show attempts to make some sort of profound statement about the consequences of man's actions, this piece is actually most notable for its entertaining footage of a cat and a couple of bears playing around in a dilapidated house. Like most of the material here, it's real riveting stuff. To its credit, the show does offer a solid assortment of information on the farming industry and threats to the animal kingdom. Unfortunately, the presentation leaves a lot a bit to be desired. As a whole, the programs are unfocused and lack cohesion, jumping around from different topics and locations with little rhyme or reason. Though some of the material covered can be interesting, the overall scope of the series is either very broad and vague or oddly specific, and many of the segments can be quite banal. The questions asked are important but, with few exceptions, the answers aren't very in-depth. Likewise, the pieces are riddled with rather pointless statistics and facts that do very little to bolster the points trying to be made. While I certainly don't disagree with the environment friendly, "green" message being conveyed, there are times when the episodes can come across as a bit preachy, and at their worst, there are instances where they teeter on propaganda. The viewpoint is very biased, and there are times where the presentation feels very manipulative (kind of like those horrible animal abuse commercials with Sarah McLachlan). As far as environmental documentary programs go, 'Earth From Above: Food and Wildlife Conservation' is a very mixed bag. There are definitely insights to be gained and there is some interesting footage of wildlife and farmlands. That is, if you find footage of farmlands interesting. Unfortunately, despite its educational content, the program lacks organization and doesn't go in-depth enough with its topics (though considering how dull some of them are, that might be a good thing). Certain segments are more successful than others, but as a whole the program never really leaves much of an impression. Unless you're a really big fan of conservationist documentaries, aerial footage of farmlands, or smiling Frenchmen, you'll likely want to skip this. 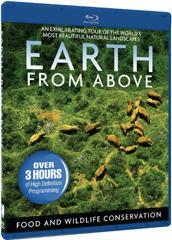 Mill Creek Entertainment brings 'Earth From Above' to Blu-ray on a BD-50 disc that comes packaged in a keepcase. After some logos and warnings, the disc transitions to a standard menu. The packaging indicates that the release is Region A compatible. The series is provided with 1080i/AVC MPEG-4 transfers in the 1.78:1 aspect ratio. Though pleasing at times, the picture is very uneven and there are some noticeable artifacts. Noise, aliasing, stuttering, flickering, minor blocking and other signs of compression are all visible from time to time throughout the presentation. While these anomalies are irksome, they don't completely ruin the image, and there are stretches that are mostly problem free. Detail is nicely rendered and the various aerial views of landscapes and up-close looks at wildlife carry solid dimension and pop. White levels are good and blacks are consistent. There is some archive footage peppered throughout, and this material is taken from low quality, standard definition sources. These instances don't look very good, but that's to be expected. The actual content of the images can be quite impressive, but the transfer is inconsistent. Frequent artifacts are visible, and the overall image resembles an average HD broadcast more than an actual Blu-ray. The audio is presented in a series of English Dolby Digital 2.0 tracks, but other foreign languages are spoken by several participants as well (primarily French). Some of the foreign language dialogue is dubbed over in English, and hardcoded English subtitles are provided for the portions that aren't. Lossy and forgettable, there just isn't a whole lot to these mixes. Dialogue and narration are clear and easily heard throughout. Minor ambient effects are spread across the two channels and there is some decent separation with the program's music score. Dynamic range is flat and bass activity is negligible. About as basic as they come, these mixes are forgettable at best. They're serviceable and are free of any major technical problems but… that's it. Move along, there's nothing to see here. 'Earth From Above: Food and Wildlife Conservation' is a mediocre documentary series. While the program hits upon some important issues, it lacks cohesion and in-depth detail, and there is a preachy, occasionally biased approach to the material. Unfortunately, the video transfer is home to periodic artifacts and the lossy audio is about as basic as they come. With no supplements, this is a pretty skippable release.